As the instructors for the Introduction to Dendrochronology class (ANTH,GEOS 464/564), we want to say Thank You Very Much for providing housing for two nights (Friday 8 Oct & Saturday 9 October) and two days (Saturday 9 October & Sunday 10 October) to our three staff members and eleven students. Thank You also for the five meals (2 breakfasts, 2 lunches & 1 dinner) you so graciously provided. Your “open house” approach to our need for housing allowed us to not bring all our tents and camping gear. Your very generous purchasing of the food and even more generous preparing and cooking of the meals also meant that we did not have to bring camp stoves, pots, pans, dishes and flatware. We also did not need to a lot of coolers to keep the perishable foods. This in turn allowed us to keep vehicle expenses down to one vehicle rental (rather than two) from the University of Arizona Motor Pool. Your time, energy and expenses concentrated on the field trip logistics. This allowed the staff and students to concentrate on the research task at hand i.e. the collection of increment core samples from living trees. This particular field trip was a multi-successful (research, education, enjoyment,…) endeavor due in a very large part to your efforts. In research terms, twenty-six (26) live ponderosa pines and douglas-firs were core sampled. Back at the Tree-Ring Lab, these cores were used to teach students how to prepare samples by glueing them into wooden core mounts to stabilize them. They then were taught how to prepare the cross surfaces with razor cuts and fme grit sanding paper. Further, they then proceeded to crossdate the samples. We have one douglas- fir tree from this collection that has an inner ring date of A.D. 1458 with an outer ring date of A.D. 2004. This inner ring date of A.D. 1458 is fairly remarkable. In many areas of the Southwest, most of the conifers seem to have established in the early to mid 1600s. There are however some isolated forest pockets and individual trees that are very old growth (500- 700+ years). This sandstone hogback may well be such a place. Given more field time by not worrying about logistics, we were also able to make contact with Chuck Hagerdon of the United States Forest Service, Mt. Taylor Ranger District. He gave us two full cross sections of Native American peeled bark trees that had been collected by his work crews in clearing areas of the forest of dead woody debris. These will be examined to provide a calendar date for the peeled bark scar . The extra time also gave us the opportunity to take the students to the El Malpais lava flows near Bandera Crater to see the oldest known living Rocky Mountain variety douglas-fir which has an inner ring date of A.D. 719. On Sunday 10 October we were able to take the students to El Morro National Monument and have a relaxed, educational tour of this very interesting area. The provided Sunday lunch from you, agai11 made for a stress free day with no worries about the food logistics. Back in Tucson at the Tree-Ring Lab, those cores from the twenty-six trees will all be crossdated and used for one of the other tree ring courses, the Dendrochronology Workshop (ANTH, GEOS 497/597). Here students will learn to measure total ring widths to a precision of 1/100ths of a millimeter. Quality control and statistical chronology development will be part of this class. Eventually, the tree ring chronology derived from these twenty-six trees will be submitted to the International Tree Ring Data Bank (ITRDB). In summary, the support from the Amaterra Foundation provided a great research and education opportunity to our students. Thank you again for generous and gracious logistical support. It made for a most pleasant field trip, one of the easiest on which we have been participants. 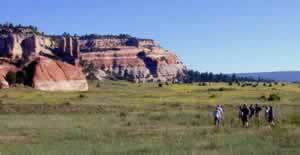 In the summers of 2003 and 2004 the ASU Summer Archaeological Field School, directed by Professor Keith Kintigh, was located in the archaeologically rich and visually dramatic mesa country in west-central New Mexico immediately east of the Zuni Indian Reservation, near El Morro National Monument. 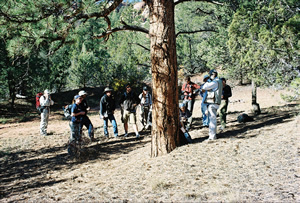 The field school enrolled undergraduate and graduate students. The project sought to understand the organizational dynamics that led to the founding, in the early AD 1200s, of numerous small pueblos clustered within the El Morro Valley, and with their abandonment, to the establishment of the large Pueblo IV towns about AD 1275. This represented a continuation of Amaterra’s many years of support for prehistoric research that holds the promise of increasing our understanding of early human interaction with the enviroment. Read a detailed scientific report of the project here.Following is Dr. Kintigh’s description of the project and Amaterra’s role. On my own behalf, on behalf of Arizona State University’s Department of Anthropology, and on behalf of the students and staff of the 2004 Summer Archaeological Field School, I would like to express our profound gratitude for the superb field support provided by the Amaterra Foundation. As you know, a key component of an effective field research project is a comfortable and efficient field camp. The Amaterra Foundation provided ASU with an outstanding base camp, with the bonus of a spectacular setting. Because of Amaterra’s support, we had an efficient kitchen and dining facilities, an excellent lab space, and marvelous tent sites. Your provision of both running water and electricity greatly facilitated our day to day activities. The showers exceeded the expectations of students and staff alike and served to, ease the long workdays. The exceptional field camp contributed substantially to the season’s positive atmosphere that very much benefited our scientific research effort. From both a research and an educational standpoint, the 2004 season was an enormous success, meeting or exceeding our research goals on all counts. We did substantial excavations at the AD 1200s Los Gigantes great house. In addition to the room excavations that indicated a substantial residential component to the structure, we further explored the public architectural elements. We discovered a large kiva largely cut, to an amazing depth, into the bedrock. We further explored the oversized, unroofed great kiva, confirming our expectations about its plan and dating. We also excavated a substantial fraction of a residential pueblo, including a rectangular, flagstone-lined kiva. It appears to share the short occupation span of the smaller structure we excavated last year (LZ 1204). We were also able to complete a testing program at a number of contemporaneous pueblos in the vicinity. Our archaeological survey was successful at documenting a number of pueblos with a variety of sizes that are near the Los Gigantes community. The results of the 2004 field work, when combined with last year’s research, will shed considerable light on the nature of the massive 13th century immigration into the El Morro Valley and into the dramatic transition to the large planned pueblos that occurred late in that century. Educationally, the program was a huge success. We had 12 college students from across the US. I co-directed the project with ASU PhD student Gregson Schachner. Four additional ASU graduate students had the opportunity, not only to teach field methods, but also to learn how to design and execute a substantial field project. All the staff were most pleased with their experiences and I have received only extremely positive feedback from the students as well. The data we have collected over the last two years, with your help, will contribute not only to my own research and that of other students but will form a key component of Greg Schachner’s dissertation. At least, two other teaching assistants, Scott Thompson and Sophie Kelly, will use project data in fulfilling their MA publishable paper requirements. The support provided by the Amaterra Foundation has been an enormous asset to the great success of our efforts. We truly cannot thank you enough.